Researchers have created contact lenses which, when paired with special spectacles, bestow telescopic vision on their wearers. The contact-lens-and-spectacles combination magnifies scene details by 2.8 times. Polarising filters in the spectacles allow wearers to switch between normal and telescopic vision. 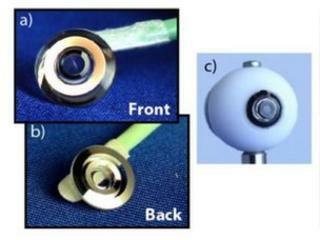 The telescopic sight system has been developed to help people suffering age-related blindness. Age-related macular degeneration is one of the most common forms of blindness and damages the part of the eye, the macula, that handles fine detail. As this area degenerates, sufferers lose the ability to recognise faces and perform tasks, such as driving and reading, that rely on picking up details. The contact lens created by the researchers has a central region that lets light through for normal vision. The telescopic element sits in a ring around this central region. Tiny aluminium mirrors scored with a specific pattern act as a magnifier as they bounce the light around four times within the ring before directing it towards the retina. In ordinary use, the magnified image is not seen as it is blocked by polarising filters set in a companion pair of spectacles. Wearers can switch it on by changing the filters on the spectacles so the only light falling on their retina comes from the magnified stream. For their filtering system, the researchers, led by Joseph Ford at UC San Diego and Eric Tremblay at Switzerland's EPFL, adapted a pair of glasses that Samsung produces for some of its 3D TV sets. In normal use, these spectacles create a 3D effect by alternately blocking the right or left lens. The prototype contact lens produced by the team is 8mm in diameter, 1mm thick at its centre and 1.17mm thick in its magnifying ring. "The most difficult part of the project was making the lens breathable," Dr Tremblay told the BBC. "If you want to wear the lens for more than 30 minutes you need to make it breathable." Gases have to be able to penetrate the lens to keep the parts of the eye covered by the contact, especially the cornea, supplied with oxygen, he said. The team has solved this problem by producing lenses riddled with tiny channels that let oxygen flow through. However, said Dr Tremblay, this made manufacturing the lenses much more difficult. "The fabrication tolerances are quite challenging because everything has to be so precise," he said. Despite this, gas-permeable versions of the telescopic lens are being prepared that will be used in clinical trials in November, he said. Eventually it should be possible for those with age-related sight problems to wear the telescopic lenses all day. The lenses are an improvement on other ways these sight problems have been tackled which has included surgery to implant a telescopic lens or wearing bulky spectacles that have telescopic lenses forming part of the main lens. Clara Eaglen, eye health campaigns manager at the RNIB said the research looked "interesting" and praised its focus on macular degeneration. "It is encouraging that innovative products such as these telescopic contact lenses are being developed, especially as they aim to make the most of a person's existing vision," she said. ""Anything that helps to maximise functioning vision is very important as this helps people with sight loss to regain some independence and get out and about again, helping to reduce isolation." The lenses may one day find their way into other areas as the research was being funded by Darpa, the research arm of the US military. "They are not so concerned about macular degeneration," he said. "They are concerned with super vision which is a much harder problem. "That's because the standard is much higher if you are trying to improve vision rather than helping someone whose eyesight has deteriorated," he said.